Written by Catherine Dale, Programme Director – Patient Safety and Experience. My friend gave the opening keynote speech at this month’s Institute for Healthcare Improvement (IHI) National Forum in Orlando, Florida. I was moved to tears in the audience watching her. I got to know Tiffany Christensen this April when we both taught on the IHI’s inaugural Co-Design college in Boston, Massachusetts. I was teaching the Experience-Based Co-Design approach. Tiffany shared her insights both as a life-long cystic fibrosis patient and as a professional patient advocate with a working career in healthcare improvement. Tiffany spoke of contending with a double lung transplant which was unsuccessful, meaning she was facing imminent death. When offered a second double lung transplant, Tiffany was initially completely thrown as she had accepted the fact that she was going to die. Being offered another chance of life was an enormous challenge to her, but in coming through that experience Tiffany chose to dedicate her working life to enhancing healthcare for others. She joined a Patient and Family Advisory Council – a core part of healthcare structure in the USA – and trained in improvement methods. When we met at the Co-Design college, she was struck by the way that Experience-Based Co-Design enables patients to have a more active and influential role in improving healthcare. This reminded me that when ‘patient involvement’ became a buzz phrase in the NHS in the early 2000s I had often wondered ‘involvement in what?’ you can’t just be ‘involved’ without context or purpose. For me the most compelling area for patients to be involved in is improving and re-designing healthcare. I am biased as this is the field of work I have devoted myself to for the past decade and a half. But I find it so rewarding that I want to provide others with that same opportunity – hence training people in Experience-Based Co-Design every chance I get! When Tiffany gave her closing thought in her keynote I found myself gently weeping: we should not consider our efforts to improve healthcare to be drops in the ocean, every one of us is a ripple and we don’t know how far that ripple will have an effect. If, like Derek Feeley, CEO of IHI, you would like to see healthcare evolve from patient-centred care to partnership with patients you can start here or contact me for further encouragement. If we add all our ripples together we will create waves. 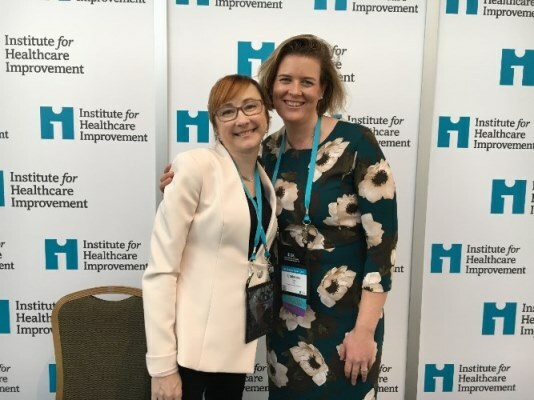 Note: Many thanks to the Point of Care Foundation, IHI and the Health Innovation Network for enabling me to attend the IHI National Forum in December 2017.